Merlot is a type of red grape which owes its origin to Bordeaux in France. It has a characteristic dark blue color and it has several uses especially in making varietal and blended wines. These wines are easy to identify from the medium body coupled with faint tastes of blackcurrant and blueberry. Saint –Emilion and Pomerol wines use a lot of Merlot in their blending of wines. Merlot is said to be very close to cabernet franc and cabernet sauvignon. Many places in the world grow Merlot and the only competitor that can match its fame is cabernet sauvignon. One of the areas that have extensive vineyards of merlot is France. Two third of the total merlot grape planted all over the world comes from there. When the grape was introduced in the US, it gained popularity very fast especially in California and Washington. One characteristic of Merlot that sets it apart from the other red grape varieties is its ability to mature early. This characteristic has made it gain popularity in Australia since it matures before the beginning of winter. In case it is late in maturing, it has been found to suffer from frost. Though it can grow in both warm and cool climates, it does well in poor conditions and if the climate is cool, it produces exceptional merlots rich in flavors that are lacking in merlot grown in warm climate. 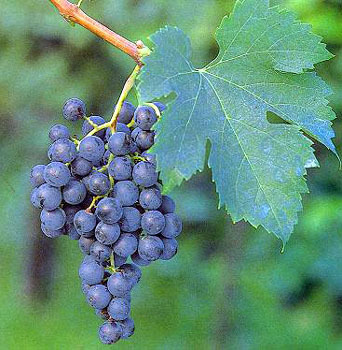 Merlot grapes are have a characteristic loose bunches of big berries. The berries have low concentration of malic acid but higher amount of sugar. It grows well in cold soil and the best soil where they do well is ferrous clay. Due to its ability to flower earlier, it is prone to cold frost and their characteristic thin skin makes them an easy target for rot. The vine requires warm climate during flowering and if the weather changes during this period can develop water stress. This explains why it does well when planted on the slopes because the drainage is better. The thin skin of the grapes makes them susceptible to sunburn, birds and splitting. Once they get any bruise and moisture gets in these berries, it rots. The grape ripens very fast once it reaches its maturity level. Winemakers have not yet come to an agreement regarding the right time to harvest merlot. Those who want to take advantage of the acidity of the wine harvest early. Other winemakers prefer the overripe grapes for the added fruit body which is brought about by the over-ripening. Merlot is primarily used for making varietal wines which have a distinct plum flavor. These wines take a short time to mature compared to cabernet sauvignon. However, some of the Merlot wines continue developing even after being bottled .There are three distinct categories of merlot: One that is brawny and highly concentrated with tannins, another one which is fruity and tannic and lastly a smooth, fruity and soft wine containing little traces of tannins. Once the wine is made, it can gain floral and herbal notes such as Laurel, Mint, Rosemary and sage. If the winemaker decides to age it in oak, these notes change to notes of caramel, chocolate, coffee bean vanilla and walnut. These wines are best paired with burnt meats. Highly acidic wines which are made from cooler areas tend to be fruitier and softer. These are best paired with mushroom based dishes and salmon. Those wines that are light bodied are famous for pairing with shell fish such as prawns. In Europe, this wine is best served with braised veal shanks or braised lamb.